RSVP for our free Pond Management Workshop. Are you thinking about building a pond? Want to know how to grow larger fish? Wondering what kind of environment you need to have a pond? 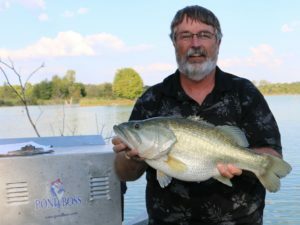 Join Argyle Feed Store and Bob Lusk, Fishery Biologist and editor of Pond Boss magazine and learn about pond management, health, and growth. Join us on Tuesday, September 26, 2017, at 6 pm. Bob will talk about all things pond. Attendees will receive a FREE bag of AquaMax Fish Food. Sign up below to qualify. Bob Lusk has 30+ years of practical field experience in the art of lake and pond management. Lusk is a fisheries biologist with a bachelor’s degree from Texas A & M University in Wildlife and Fisheries Sciences, fisheries management. His talented writing skills, combined with many, many years of hands-on experience, makes him one of the best-known lake management consultants in the world. Pond Boss Magazine is the nation’s leading resource for private fisheries management and stewardship today. Pond Boss offers a print magazine, chock full of practical, usable information. You can also find a variety of media content on the Pond Boss website, including audio podcasts, video vignettes and free articles from the storied history of the magazine. This entry was posted on Monday, August 7th, 2017 at 9:18 pm	and is filed under Events, News & Updates, Pond, lake, fish. You can follow any responses to this entry through the RSS 2.0 feed. Both comments and pings are currently closed.